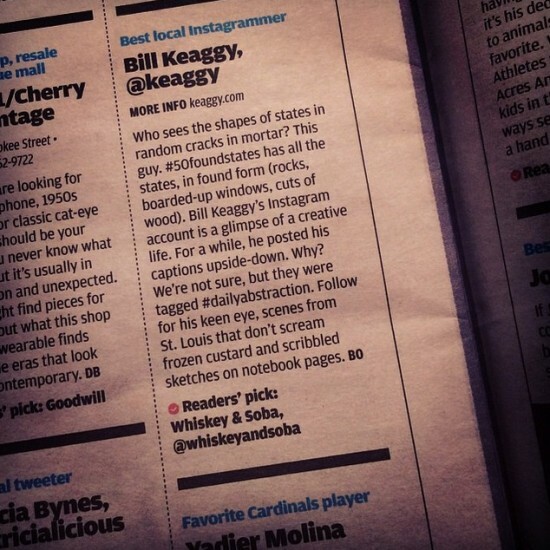 Quite pleased to be selected as St. Louis’ “Best Local Instagrammer” by the St. Louis Post-Dispatch‘s GO! Magazine. Who sees the shapes of states in random cracks in mortar? This guy. #50foundstates has all the states, in found form (rocks, boarded-up windows, cuts of wood). Bill Keaggy’s Instagram account is a glimpse of a creative life. For a while, he posted his captions upside-down. Why? We’re not sure, but they were tagged #dailyabstraction. Follow for his keen eye, scenes from St. Louis that don’t scream frozen custard and scribbled sketches on notebook pages. I know there are many, many better Instagrammers here in STL, but thank you! I’m @keaggy on Instagram. PS: The #dailyabstractions captions were upside down so people would not immediately understand what the abstracted photo was and could absorb it minus context.